Control your outdoor lights and devices with your smartphone from anywhere. Program your deck lights to turn on at sunset, turn on or off the outdoor holiday decorations from the warmth of your home, schedule a fountain to turn off at the same time each evening, or set outdoor spot lights to illuminate your trees while you’re away. Simple control, all at your fingertips. 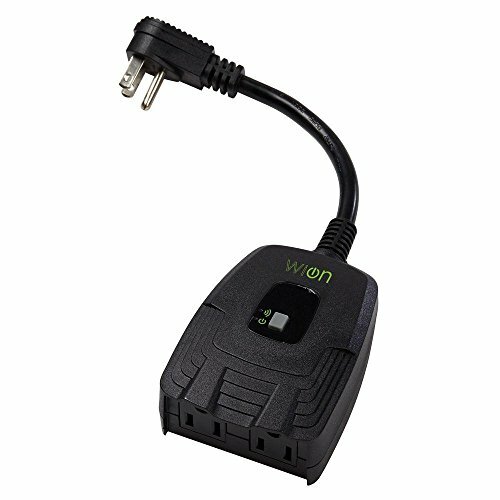 WiOn smart plugs, wirelessly connect all of your favorite devices using our simple, feature-filled products. Download the user-friendly app, connect your device to your smartphone using your existing Wi-Fi network, and begin controlling your device from anywhere - at home or on the go. There are no set-up fees, no hub required, and no monthly charges. You can even expand your system to include multiple indoor and outdoor smart switches, which do anything from lighting the front porch to turning on and off the living room lamp automatically. With WiOn, wirelessly updating your home is simple. Support for WiOn is available at 1-800-561-4321.